Yamaha YZF-R15 Version 3.0 Moto GP edition is a pure cosmetic job. The limited edition boasts of Movistar Yamaha MotoGP team bike inspired livery and adds-on for extra Rs 2,000 over the regular version. India Yamaha Motor Pvt. Ltd has launched a limited edition version of its YZF-R15 Version 3.0 150cc supersport bike christened Moto GP edition. 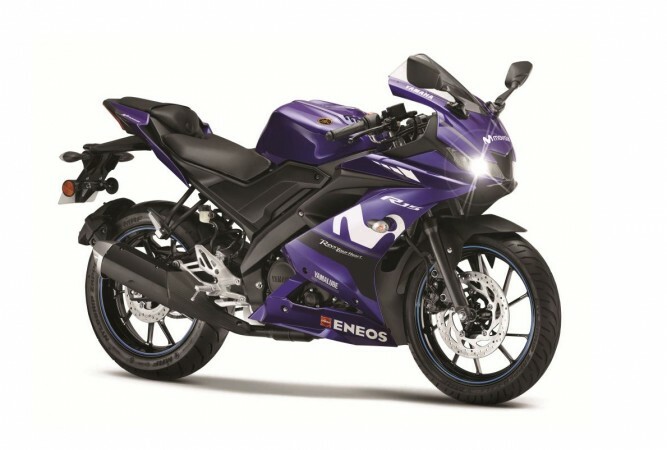 The new edition, as the name suggests, takes inspiration from Yamaha's MotoGP race bikes and has been priced at Rs 1.30 lakh, ex-showroom Delhi. 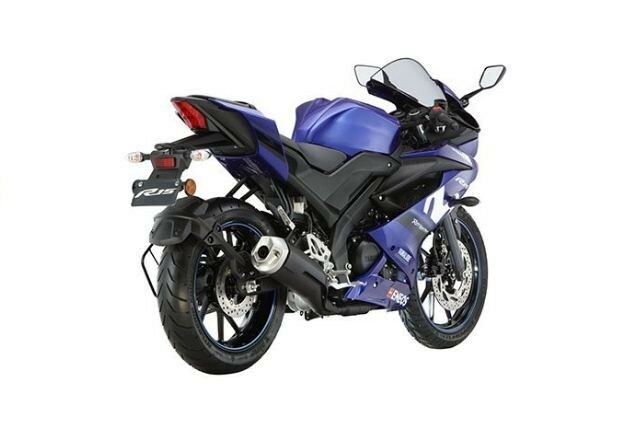 Yamaha YZF-R15 Version 3.0 Moto GP edition is a limited edition model. While the company has not mentioned the number of units they intend to sell in India, its website indicates that around 3,500 units are being allocated for India. The online bookings have already started. Yamaha will start deliveries of the Moto GP edition from September. Yamaha YZF-R15 Version 3.0 Moto GP edition is a pure cosmetic job. It comes draped in Movistar Yamaha MotoGP team's blue shade as the base colour. The Movistar logo at the on the headlamp cluster and fairing adds a race-bike styled livery. 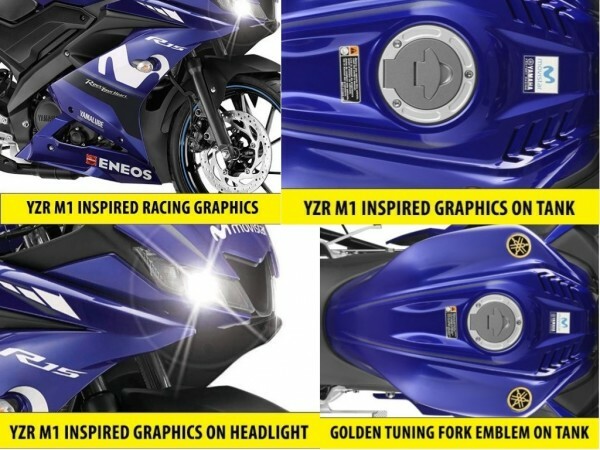 The special edition features ENEOS logo on the belly pan while racing numbers of Yamaha's MotoGP riders, Valentino Rossi and Maverick Vinales are not added. The YZF-R15 Version 3.0 Moto GP edition boasts of signature tuning fork emblem of Yamaha in golden colour at the fuel tank. It also gets YZF-R1 inspired graphics on the tank. Rest of the MotoGP edition is identical to the regular YZF-R15 Version 3.0 launched at Auto Expo 2018 in February. The Yamaha motorcycle is powered by a new 155cc liquid-cooled SOHC 4-valve fuel-injected engine in place of the 149cc engine. The engine has a 58.0-58.7mm bore and stroke, and an 11.6:1 compression ratio. It produces a maximum 19.3bhp of power at 10,000rpm and a maximum torque of 15Nm at 8,500 rpm. The mill comes mated to a six-speed transmission that also features an assist and slip clutch. Based on the Deltabox frame, India-spec YZF-R15 Version 3.0 get a conventional telescopic suspension in place of USD shocks up front to keep the price in check. The rear gets mono suspension unit. Braking power comes from 282mm disc brake with a two-piston calliper at the front while the rear gets a smaller 220mm disc while ABS is not the part of the package. The regular YZF-R15 Version 3.0 is now priced at Rs 1.27 lakh (ex-showroom Delhi) and offered in two colour options -- Racing Blue and Thunder Grey.